The Proslat ProRack Tire Storage Unit provides handy storage space in your garage. And easy access for your off season tires below your existing ProRack. Made of high load-bearing steel, this heavy duty unit has been load tested to handle weights up to 350 lbs. 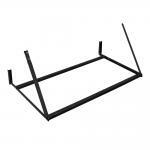 Shelf Weight Capacity: 250 lbs./ Total Weight Capacity: 375 lbs.